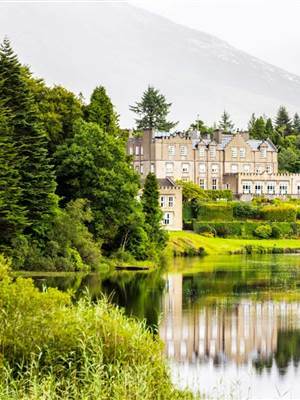 The town of Clifden is located a 15-minute drive from Ballynahinch Castle Hotel. This charming town is often considered as the Capital of Connemara. Set in a picturesque location, Clifden is nestled between the Twelve Bens Mountains and the Atlantic Ocean coastline, with the Owenglen River flowing past the town’s edge into Clifden Bay. 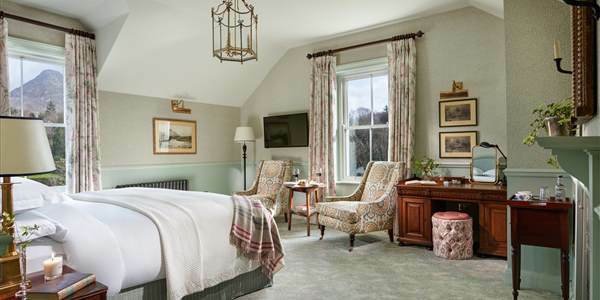 Stay at Ballynahinch Castle Hotel near Clifden, just a 15 minutes drive and in the heart of Connemara. Make sure to check our Special offers. Check our rooms and availability here. This bustling town at the edge of Europe, is the epitome of Irish life, with great pubs, restaurants and shopping. Visitors can spend their day browsing through the many shops or soak up the atmosphere on a stroll around the town. 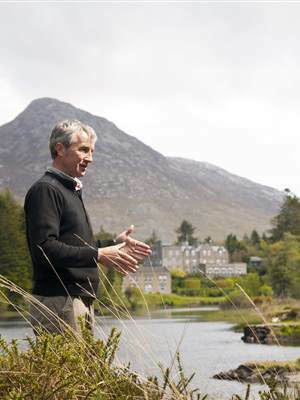 It is a must visit town when touring Connemara. Clifden is situated along the Wild Atlantic Way and there are several viewpoints only a short drive away. Explore the surrounding boglands while visiting the landing site of the first transatlantic flight at Derrigimlagh, get panoramic views of Clifden Bay on the Sky Road drive or discover the tidal island of Omey, which is accessible on foot during low tide to name just a few.